After a fun drive down a curvy forest flanked road, you emerge into the sunlight with expansive fields on either side of you. You turn left down a dirt path that takes you by an old farmhouse. You dogleg around another field and enter the woods on a gravel road. When you get to the gate you step out. Through the trees, you can vaguely see the vastness of the James River and you hear the sound of a light breeze as it tumbles amid the leaves. Back in your vehicle you steer right, around the driveway loop and notice that you are at the peak of a hill that drops deeply into a great wooded ravine on either side. Straight in front of you is the cottage which sits at the tip of the peninsula surrounded by views of the River. You shut off the vehicle and step outside. There is not another home or person in sight. NOW....You are officially on vacation. You stroll down the brown pebble path and past the shed that was built by boy scouts in the early 1900's. The breeze from the river feels stronger now and you can see the detail of the water and the white sandy beach below. Just as you step onto the entry deck you notice two adult bald eagles soaring above the beach looking for prey. You didn't have to look up to see them they were at eye level with you. You are 70' above the river and the surrounding forest floor. The experience is like being in a treehouse; Albeit, a treehouse with a 4 acre yard, and parking for 20. The breeze is loud in the trees now and gives you the feeling of being blanketed by nature. You jiggle the knob and are inside. Looking around there's nothing fancy, yet everything is special and somehow comforting. Hand made arts and crafts, Americana, books and furnishings you could only find in a cottage that's been a family heirloom for generations. You want to settle in but looking out the window you see an inviting path that winds down the hill and dissipates into the woods. You think, “I bet that leads to the river” and with that you are out the door on your first of many adventures. The Riverhouse is just 10 minutes from the ferry. The ferry is free and you simply drive aboard. The ferries run continuously, with one every 20 minutes or so. The ferry ride is is a pleasant 15 minute site-see on the James River. There is an observation deck for looking at Historic Jamestown. Merchants Square and Busch Gardens/Water Country is only 10 minutes from there. This property has been in the family since the early 1900's. The area's rich history and the tranquility and privacy of this property make it a family heirloom. The connection to America's historic native americans, colonists and explorers is profound. Proof of this area's active past is evident in the fossils and other historic items that over the years have been found along the beachfront. A robust kayak paddle up or down the river provides views of several historic waterfront plantation homes. I enjoy putting myself in the shoes of an early american as I navigate the property. This helps me to appreciate the preservation of this area and it offers me a different perspective when viewing the modern world. A walk on the beach and the challenge of finding the smallest and largest of shark teeth is very therapeutic and is a must do on every visit. The 'missing' electronic devices like TV and internet provide us with the 'missing' time we never seem to have. Amazing views of the river from the house and grounds. Private white sandy beach with shells and Shark's teeth. (2) Top of the line dish drawers. Take your pick: Percolator, drip (with permanent filter) or french press. Electric or manual bean grinder. Loads of dishes, utensils and cookware. CrockPot too. Expandable with extensions stored inside table. 2 Kayaks and 1 canoe (seats 2-3), 1 adult SUP and 1 youth SUP, paddles and life jackets for all. 4 ACRES OF WOODED PRIVACY!!! Loads of parking and a loop for easy trailering of boats and campers. Great views from approx. 70' above the James River. Path brings you to your own private white sandy beach. TONS OF PREHISTORIC SHARKS TEETH mixed in with the shells. Very quiet and romantic. Great for couples or for families. Beach area and river bottom is clean, safe and great for swimming. TWO KAYAKS AND A CANOE with paddles and 'high-end' life-vests, sized from toddler to He-Man. Lots of books and games. Watch out, you can loose/find yourself here! Cottage has been a family gathering place for 30 years and is as comfortable as your favorite pair of jeans. This was our 4th time at the James River House. It is the perfect place to refresh your soul. No TV. Trees, wildlife, beach. We think of the house as "our peaceful getaway". It is a priority visit at least once a year. Charming cottage tucked in the woods with beautiful views of the river and a sandy beach at the base of the bluff. Absolutely amazing! Would live here in a heartbeat if it were an option. A little slice of heaven and what a beautiful beach!! I loved it so much! I thought the kids might drive us insane with no TV or internet but the separation from the world is exactly what we needed as a family. Very cozy, great place for a getaway! Love it and plan to go back soon! A winding country road takes you through a gate to an opening in the trees. You see the James River from the hilltop as soon as you arrive. Walk down the lighted path to the private beach to find shells, driftwood and sharks teeth. The cozy two bedroom cottage was nice for a break from technology. No wifi or TV meant the family could unplug for a few days and spend those hours reading books, playing board games, roasting marshmallows at the fire pit and walking dogs on the beach below. There was enough cellular service to check emails and make phone calls, so this was a plus. We enjoyed the proximity to Williamsburg, which is just a ferry ride away. Busch Gardens, Jamestown, Yorktown and every restaurant and store is on the other side of the James River, easily accessible within an hour using the ferry. Very private location. Lots of fun. The property was great. Amazing setting, clean and well stocked, The best thing was no TV. The fire pit and outdoor speakers made it fun to hang out at night. The beach is beautiful and the path down to it is well marked. Loved the appliances , including the deck grill. The owner was very helpful and responded quickly to questions about the property. I highly recommend this rental. 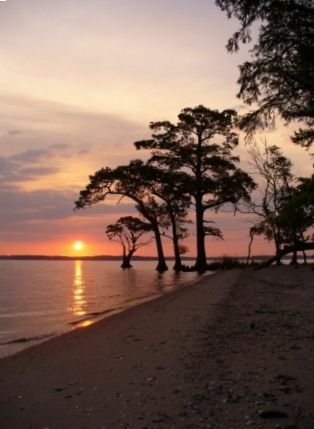 Guests can take advantage of the cottage's location on the James River and they can go kayaking and canoeing straight from the private beach. This location offers acres of privacy. Two kayaks and a canoe with paddles and 'high-end' life-vests, sized from toddler to He-Man are included. There is a private sitting area away from the house with amazing views of the river. There is also a fire pit and seating on a 70' hilltop overlooking the river. The Chippokes Plantation Park is home to a historic farm museum along with a plethora of outdoor attractions including equestrian trails, a swimming pool, and picnic areas. It also hosts special events throughout the year, providing fun for all the family. In the town of Surry guests can find a winery, several beautiful plantations including Smith's Fort Plantation, the Brandon Plantation and Gardens, and the Lightwood-Historic 18th Century Plantation House. In the neighboring towns of Smithfield and Williamsburg guests can enjoy more of our nations history by visiting the colonial areas and the original fort at Jamestown. Busch Gardens and Water County are also fun for the whole family.